She began her musical career in a choral training programme with the Cape Town Opera ten years ago. Thereafter, she registered at the University of Cape Town in 2001, where she studied the art of professional opera singing. 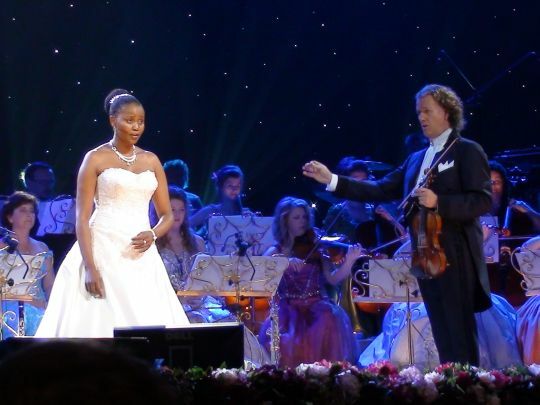 Earlier this year she received a call saying that André Rieu was looking for a female black soprano. Skota told Sowetan: "I immediately sent in my resume and a few recordings for his consideration. After a week or so, André called me and said that he liked my voice and asked if I could fly to Holland for rehearsals". "Fortunately for me I was available. I spent a week with the orchestra getting to know how they work and learning the music. I continued to rehearse and learn the words to the songs when I arrived home. I also had to practice the dance moves that I had to perform on stage. "Everyone in the orchestra including André was very supportive and it has been fun working with them," she says. "This opportunity has been a blessing in disguise, it has come just at the right time in my career, and I believe that it is going to open many doors." Skota, who is currently touring with Andre Rieu and his orchestra, introduced local content to the repertoire by singing a traditional lullaby ‘Tula Tula’, the ‘Sarie Marais’ and Vicky Samson’s ‘African Dream’. Andre is the best, I have listened to classical orchestras and love them but with Andre his humanitarian nature far exceeds the passion in troducing new talent to his fans. Carmen, Suzan, Carla, Mirusia and now Kimi in S.A. In every country he visits we're probably going to see new faces, my love for Andre far exceeds the music. You're in my heart forever! Where can I find your 'thula' to listen to?